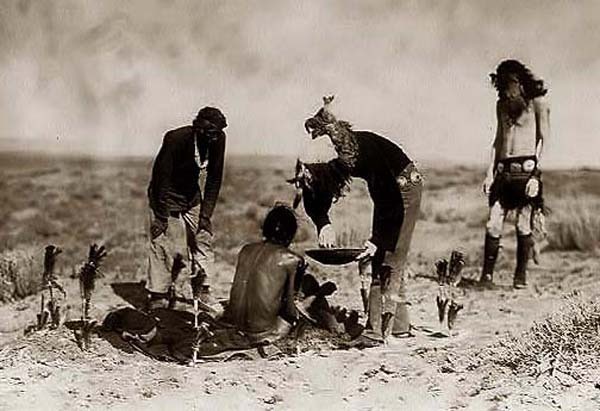 The following are of the teachings of the Navajo elders and Medicine men, still handed down. Before arriving into this world, the Dineh transversed through other worlds first, being led and taught by the Holy Ones, this also gave them their ceremonies. The commencement of time was called the First or Black World. Abiding there, in spiritual form, were the Holy People and the Insect People . Living also in spiritual form was First Man and First Woman which was called into being by the Holy People. Because of the constant fighting and practicing of witchcraft by the Insect People everyone moved upward. They found the Blue World through a portal in the east, but unfortunately the evil came with them. Many creatures already resided in the Second or Blue World. War between the Wolves, Badgers, Kit– Foxes and Mountain Lions which lived there had caused much sadness and suffering everywhere. Pleas came from everyone to leave. Taking away the power of evil from the Insect People and getting ready to leave, First Man fashioned a wand of turquoise, white shell, jet and abalone. The wand transported everyone across to the Third World through a window in the south. The first to pass into the Third or Yellow World was the Bluebird which was followed by First Man, First Woman, Coyote and one of the Insect People. After a time Coyote caused a great flood by stealing the water Monster’s baby. To escape the rising flood waters, First Man directed everyone to climb a reed and as they did so they discovered Coyote with the Water Monster’s baby. Upon reproach from everyone, Coyote returned the baby and the waters began to recede. East: Blanca Peakj South: Mt . Taylor; West: San Francisco Peaks; North:La Plata Range. the sound was coming from a nearby black cloud. Changing Woman who was born of the darkness and of dawn was found in this cloud. When she grew up, she produced twin sons, Monster Slayer and Child of the Water. These twins relieved the world of monsters. Their mother, Changing Woman, also created the four primary Navajo clans.